The alarm goes off. It goes off again. And again. And again. Until you realize you have a grand total of 20 minutes to get to work. You throw on the first thing your hand grabs in the closet, grab a nasty gas station coffee and the one donut left, and walk into work. Instantly, you regret it. The trash is overflowing. There’s smashed chips still on the floor from the work party on Friday night, and ants are in a line thoroughly doing their best to do the job the commercial cleaning company should have done. Happy Employees Cleaning’s mission is to prevent this scenario from ever occurring. Our goal is to make your employees happy (which makes the business owner happy) by creating a welcoming, warm, inviting, and most importantly, a clean workspace. 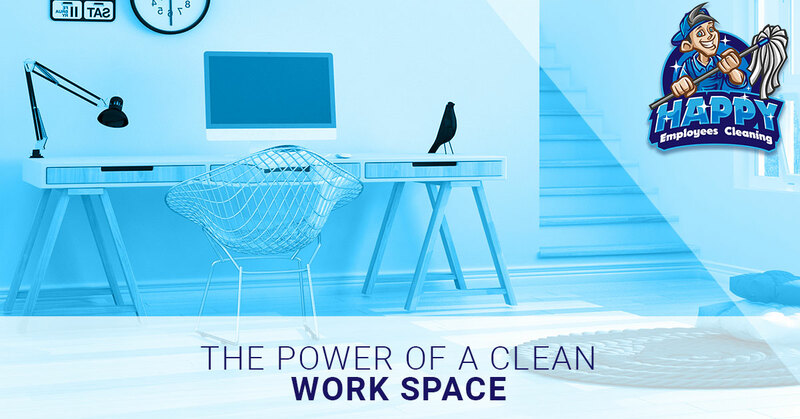 The power of a clean workspace cannot be underestimated. Read more below, and if you are in the West Fargo area, contact us today to begin your commercial cleaning service! Lowers stress. When you walk into a dirty environment, the first thing you have to do is clean up — not respond to customers’ needs, emails, or phone calls. Stress not only has detrimental effects on the body, such as high blood pressure and heart problems, but stress can also affect attitude, attention to detail, and overall investment in the company. Employees like to brag about where they work and be content there. When their workplace is a place of embarrassment, you can bet the door is not far away. Improves employee morale. Like the scenario above, employees appreciate coming to work in a nice, clean environment. Things like emptying the trash can because it’s overflowing, restocking the toilet paper because it’s out, or getting the vacuum out to clean up a mess they didn’t make not only interrupts workflow and results in overall less productivity, but these things also create resentment amongst employees both against the business and against other employees. Improves employee absenteeism. Like the scenario above, that employee could have easily have called in sick. And little things like the prospect of coming to work in a not-so-clean environment could have been the tipping point. This results in lost productivity for the business, an increase on stress on other employees who have to fill in, and possible job turnover as this employee may instead spend the day on the internet, looking for another job. Happy Employees Cleaning in West Fargo desires to create a happy and healthy environment for your employees. Our janitorial cleaning services include emptying trash bins, replacing trash bags, vacuuming all floors and mopping all hard surfaces, wiping everything down that is collecting dust, spot cleaning walls and doors, washing the interior of your windows, and restocking toilet paper and paper towels. We offer a 100 percent happiness guarantee, so if you’re not satisfied for any reason, we’ll make it right and make it free until it’s perfect. We want to make your work environment easy to come to and hard to leave. Contact us today!